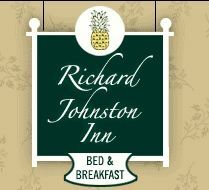 The Richard Johnston Inn & 1890 Caroline House: Ask us about our winter specials! The Richard Johnston Inn is a distinct upscale 18th century Inn, constructed in 1770 by architect John Taylow, one of the original signers of The Declaration of Independence. In the 1800’s, the building was home to the Mayor of Fredericksburg, the Inn’s namesake, Richard Johnston. The award winning Inn offers seven beautifully appointed and luxurious guest rooms, 2 suites and caters to small, intimate weddings and other special events in our courtyard and parlors. Our air-conditioned guest rooms have private bathrooms and complimentary toiletries. A delicious breakfast is included with your stay and served daily in our beautiful dining room. The Richard Johnston Inn is located in the heart of historic downtown Fredericksburg, VA, within walking distance to many restaurants, historic venues and quaint shops as well as to The University of Mary Washington. The 1890 Caroline House is located a block away from The Richard Johnston Inn. The Caroline house was built in 1890, and is a Victorian-esque home that provides guests a delicious blend of history, elegance, and modern day luxury.